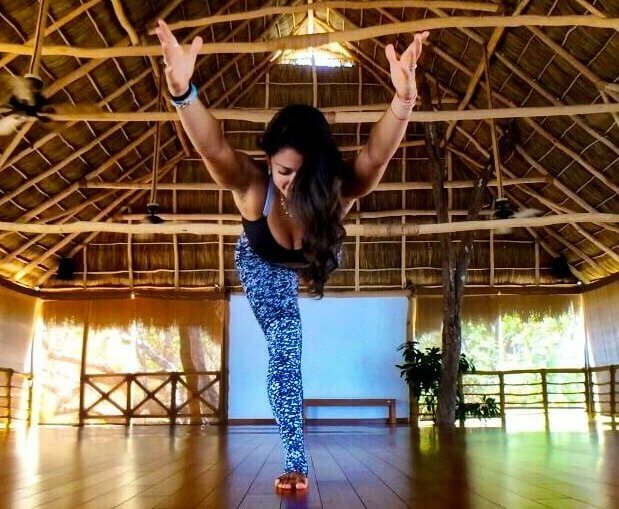 If you’ve ever started or ended a yoga class with “Om”, then you have chanted mantra! Yay! Mantra is a Sanskrit word derived from two roots: man, meaning “mind”, and trai, meaning to “protect”, to “free from”, or “instrument/tool”. So mantras are tools of the mind or tools to protect or free the mind. Mind-protection tools?? How awesome is that?! A mantra is a word, sound, or phrase. When recited repetitively, it serves as a form of meditation. We use the repetitive sound – the mantra – to focus the mind. “Om” is the most well-known mantra. 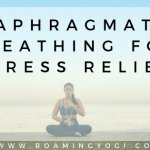 This style of meditation is one of my favorites because it’s so accessible. The repetition of a mantra gives your mind a concrete anchor to focus on, making it a bit easier to keep the mind from wandering. You repeat it out loud. This engages more of your senses, making it easier to keep your attention focused. The lips and tongue move, but there is barely any sound. This practice is subtler and deeper than the verbal recitation. You repeat the mantra silently, in your mind. This is more difficult to do, which is why we start with verbal recitation. At this point, you are no longer repeating the mantra, but the mantra goes on by itself in your mind, spontaneously, all the time. This will start to happen if you stick with a mantra for an extended amount of time, reciting it every day. If your mind is super busy, or there is a lot of ambient noise, you might want to “turn up the volume”, so to speak, to make it easier to focus. Mantra meditation is my go-to when I can’t find a quiet place to meditate because it allows me to block out the sounds around me. 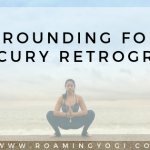 You can set a timer and practice for a certain period of time, or you can practice a set number of “repetitions.” Traditionally, you recite 108 repetitions of your mantra. The significance of the number 108 is open to interpretation, but it has long been considered a sacred number in Hinduism and in yoga. If you want to practice 108 repetitions of a mantra, you’ll want to use a mala to help you keep count. Used for keeping count during mantra meditations, a mala is a strand of 108 beads, plus a guru bead. 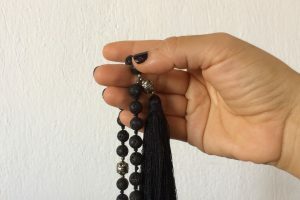 Malas can also be made with 27 beads for use in shorter meditations (or you can go around the mala four times to complete the 108 repetitions). They are often placed in shrines as a reminder of the intentions behind the meditations. Round beads are utilized for making malas; this shape allows them to glide easily through your fingers. These beads are usually 7-8mm, or 10mm in size. Traditional malas are made with rudraksha beads, lotus seed beads, yak bone, bodhi seeds, or wood. Some malas are made from gemstones, which have different properties and colors. Some popular mala gemstones are black onyx, turquoise, rose quartz, or jade. One of my favorite malas has lava beads! You can select gemstones that match the intention of your practice or your mantra. There are several mala styles. Some have only 108 beads and a guru bead; others also incorporate a tassel. All malas with 108 beads can be worn as necklaces or as wrapped bracelets, and many Western practitioners wear their malas when they are off the mat to remind them of their yoga practice and their intentions. Short malas have 27 beads, for shorter meditations; these malas are often worn as bracelets off the mat. Traditionally, a teacher or guru gifts a mantra, but you can choose a mantra for yourself depending on what you are seeking. When choosing a mantra, consider your motivations for practicing meditation. Perhaps you’re looking for positivity, health, happiness, self-love, or to find balance. Whatever it is, choose a mantra that aligns with that. You can choose a mantra in English, such as “I am abundant”, or “I am grateful for all that I have.” Or you can select a Sanskrit mantra. Sanskrit is the ancient language of India, and it is unique because, in Sanskrit, the meaning of a word is not separate from the sound of the word. The sound is the meaning. Further, sound is vibration, and each sound of the Sanskrit alphabet has a corresponding vibration in our body. When we chant Sanskrit mantras, the sound and meaning of the words reverberates within us. Translation: The sound of the universe. It’s the first, original vibration and represents the birth, death and re-birth process. When chanted, the sound Om vibrates at the frequency of 432 Hz, which is the same vibrational frequency found throughout everything in nature. This is what makes Om the basic sound of the universe. By chanting it we are symbolically and physically tuning in to that sound and acknowledging our connection to all other living beings, nature and the universe. Translation: May all beings everywhere be happy and free, and may the thoughts, words, and actions of my own life contribute in some way to that happiness and to that freedom for all. This mantra encourages cooperation, compassion and living in harmony with the environment, animals, and our fellow human beings. This is one of my favorite mantras because it reminds me of the kind of life I want to lead; particularly in these highly polarized, divisive times. This is a nice one to chant if you want to dedicate your practice or meditation to someone. Translation: I bow to the elephant-faced deity, Ganesha, who is capable of removing all obstacles. I seek his blessings and protection. In Hindu teachings, Ganesha is the god of wisdom and success, and the remover of obstacles. This mantra is perfect to chant when you are embarking on something new or when you need some guidance. Ganesha is my favorite deity and this is my favorite mantra. I always draw on it when I’m facing a big challenge in life, or when I’m feeling uncertain or ungrounded. Translation: I bow to the Goddess Tara, who liberates us from fears and blockages. Also known as Mother of Mercy and Compassion in Tibetan Buddhism, the Goddess Tara is attributed with abundance, protection, enlightened activity, long life, and compassion. By chanting this powerful mantra, we invoke the blessings of Goddess Tara and request her protection from danger and from our fears. You can also chant this mantra to overcome mental, physical, or emotional blockages, as well as blockages in relationships. Hold it in your right hand, draped between your middle and index fingers. Place your thumb on the bead to the right of the guru bead as you begin reciting your mantra. At the end of the mantra pull the mala bead towards you with your thumb and move onto the next bead for another recitation. Do this 108 times, traveling around the mala, until you once again reach the guru bead. If you wish to do another round of repetitions, do not skip over the guru bead. Instead, begin to push the beads in the opposite direction. Using a mala gives you another anchor to focus your attention – the physical sensation of the mala in your hands. Ready for your own mala? 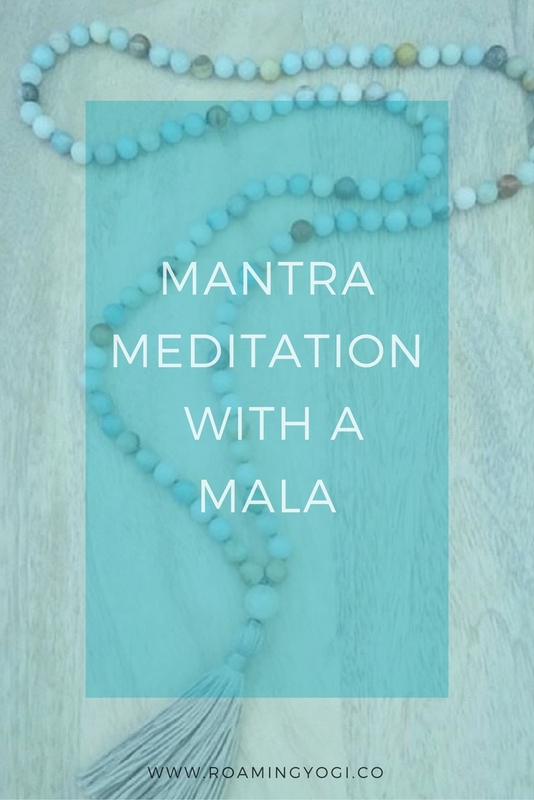 If you’re looking to get a mala for your mantra meditation practice, you’ll want to consider whether you want gemstones or not. You can seek out gemstones that align with the intentions you want to manifest; or if you’re looking for something simpler, you’ll probably want rudraksha or sandalwood beads. There are tons of malas on Etsy that you can check out – many handmade and just gorgeous. A few mala makers that I love are Malas With Love, Mala Collective, and Buddhahood Beads. I happen to be a Malas With Love ambassador, so if you like their stuff and want 15% off, use code _ROAMINGYOGI15 at checkout! Do you have a favorite mantra? Share them in the comments! I am extremely engaged in this method. I love the enthusiasm and I am thrilled with my progress. Thank you for your support! Hi Tiffany! I’m so happy to hear that. It’s such a wonderful form of meditation 🙂 If you ever have any questions, don’t hesitate to reach out!